It's difficult to overstate the disaster in the making. Click on the title of this post to read the Wall Street Journal's editorial which is the definition of must reading. Click on the title of this post to be taken to US Patriot Pac's homepage. Friend of Minnesota Conservatives, US Patriot promotes patriotic local and state candidates. Sign up for more information and consider donating to this most worthy cause. Please also note we have placed a link in our blog roll to the site. Carthage delenda est! Click on the title of this post to go to the article. Nothing more to add. Apparently, last night's Executive Committee meeting of the RPM was quite interesting. After an orchestrated attack on Dorothy Fleming by one of the Chair's flaks failed spectacularly, the matter of sending threatening letters to Minnesota republicans was raised. No one on the Executive Committee admitted to knowing about the matter before the letters were sent. (One member from CD5 had been sent it previously but stayed silent at the meeting) Blunt, honest, penetrating questions were asked (the kind RPM leadership avoids at all costs) and precious little by way of sense or substance was given in response by the Chair. It's fair to say most members knew nothing about the matter before last night. How can one person be allowed to do so much damage with so little accountability? In fact, at one point the Chair demanded to know how a member knew of the letter's existence! He was told it was on the web. D'oh! Copies of the letter posted below (click on the image to enlarge) were handed out after members requested it. What is risible is that the "Dear Sir/Madam:" line was redacted. Why? Because the sharper pencils in the box would realize such a salutation gives away the fact that this is a form letter. Crank in the name of the offender du jour and out goes the turgid letter. Another person was sent the same baseless but threatening letter and it had the same salutation. Form letter indeed. As a classy touch, the Chair sent that letter to this person's day-job employer. His employer had nothing to do with this person wanting to improve the party. The letter was sent to harm him financially. I do love those in public life who feel compelled to publicly witness to their faith in Christ: repulsive behavior is sure to follow. Check back soon for further adventures in fear and loathing. Their time is running out. Republican Party Threatens To Sue Us! 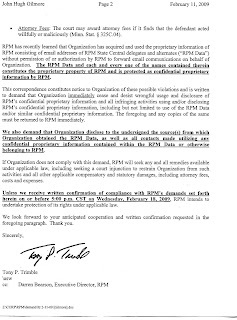 Yesterday one of us received the posted letter from RPM's attorney claiming we have used a trade secret of the Party's. Apparently, the "trade secret" is the email list of state central committee delegates and alternates. No, really! MC has replied that to its knowledge it possesses no trade secrets of the RPM. Not as worthless as one might think. However, there is plenty of silly to be had as well. Reagan was a faux conservative? Who knew! Because of that America is Argentina today. Click on the title to this post to read other leaps of fancy, non-sequiturs and general squishyness, always but always earnestly expressed at The New Republic which, it seems to me, shouldn't be as focused on conservatism as it is given its belief that its time has passed. Or maybe it fears it really hasn't? She has her latest up now at Salon. Click on the title to this post to read her. Read anything she writes anytime she writes. Yes, she's that good. No, she's not a conservative. Well how about that Israeli election? Let the government building games begin. I was so hoping for Netanyahu but perhaps he'll win out in the end. Livni strikes me as too squish. Gee, Iraq and Israel holding elections. More countries, please. David Hazony over at Commentary's blog Contentions has a good take on what the voters did and didn't do. Click on the title to this post to read him. I found it insufferable; the conventional wisdom seems to be shaking out that he didn't make any mistakes ergo it was a success. Let's not set the bar too high now, even though he is The One. Two observations: Obama is forced to defend a bill not of his own making. Larded with every conceivable spending program possible, Mr. Hope & Change has turned to fear mongering of the most overt sort. Wasn't fear mongering one of the chief complaints of squishes about W? Yes, I thought so. Obama's answers were long winded. His tone hectoring. That will wear thin quickly. Loved that he called on the Huffington Post, a moonbat website. The press said nothing. And squish radio talk show host Ed Schultz had a front row seat. Passing strange. Second, this fellow talked about "mutual respect" between the USA and Iran. Really? A state sponsor of terrorism? One that kills its citizens at a frightening clip, stones women but not men (usually) for adultery, imprisons/kills gays and represses every twig of dissent? THAT kind of respect? Whatever happened to the notion that respect is to be earned. Click on the title of this post to see Emanuele Ottolenghi's comments, especially on that fool Biden who waxed eloquent in Germany about Iran's great civilization. All people are equal; all cultures are not. Mark Steyn Before The Ontario "Human Rights Commission"
Canadian blogger extraodinaire Denyse O'Leary, and a friend of Minnesota Conservatives, supplies this transcript to the testimony of Mark Steyn before the Ontario Human Rights Commission. Click on the title of this post. O'Leary has followed closely the travails of Steyn and others before the Stalinist Human Rights Commissions of Canada. If you don't know about this story, you really haven't been paying attention. Repent and bone up on this crucial story now by reading O'Leary's transcript and subscribing to her blog. Then do some Googling. With The Messiah ensconced, no one can tell what fresh hell may be visited upon us in the name of the "public good." Melanie Phillips Takes On The Global Warming "Consensus"
Click on the title to this post to read Melanie Phillips address the latest PR attempt to insist there is a global warming consensus. There's not much left of the warmers by the time she is finished. Apparently David Frum is to The New Republic what David Brooks is to the New York Times: its idea of what a conservative is. Click on the title of this post to be taken to the TNR story. The tone of the piece is alternatingly snarky (lime green tie?) and patronizing (Frum is a courtly man in his late 40's--and how over is that?). David is patted on his rather too-well self-regarded head for trashing Sarah Palin (he regarded her as a threat to national security; no, really). Seriously, how else could he have cocktails with Brooks and the late* Peggy Noonan if he said anything civil about Palin? Conservatives must be on guard against being marginalized by some in their own Party. Frum is a perfect example. By all means let him run a vigorous website and throw out ideas as they come to him. But conservatives are perfectly within their rights to decline being characterized by those who wish there were rather fewer of us or, if we must be around, haven't worked our way up a corrupt party system to run, say, oh, a large energy rich state. And when someone like Frum suggests that obesity has implications for national policy (Nanny State Alert!) we can be excused for leaving the conversation before he brings up global warming. *On the Sue Jeffers show 11/08/08 after the election I declared Peggy Noonan dead to me, hence the tag "the late Peggy Noonan." wonderful people will not participate in. help bring good from these trying times. MC On The Sue Jeffers Show: Should We Bronze Her? Barbara and John were on for the full two hours tonight. Click on the title of this post to get the podcasts of the program. 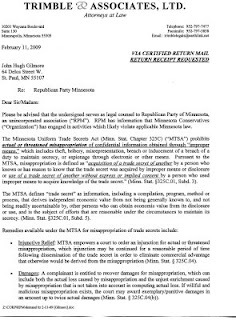 Sue Jeffers is indispensible to the conservative cause in Minnesota. Chairman Steele has requested the resignation of everyone on the staff of the Republican National Committee. MC has been flooded with emails and phone calls from various activists applauding this move. Indeed, in one fell swoop Steele has lifted all of our spirits, at least those spirits who know that the entrenched, hidebound party establishment is a large part of our current problems. As for Minnesota? Will Tony Sutton or Brandon Sawalich clean house? Ask them. We attended the Budget Hawks blowout at Trocadero's last night in Minneapolis. Congratulations to the organizing groups for an unqualified success. People from an array of conservative groups were there, exchanging ideas, networking and simply enjoying each other's company. Click on the title to this post to go to Minnesota Budget Solutions to see what you can do to become involved in setting responsible budget goals and priorities. It's your money. No, really. MN Conservatives On The Sue Jeffers Show Feb. 7th! Join us this Saturday, Feb. 7th on the Sue Jeffers radio show from 5 to 7 on KTLK FM 100.3 Sue wants to discuss the state of the senate race in the first hour. In the second she plans to ask about Minnesota Conservatives, who we are and what we want to accomplish. No doubt there will be plenty of discussion about the state of the Republican party in Minnesota and how best to fix it's many problems. If you can't listen live you can go to the station's website (click the title of this post to do so) and listen to Sue's podcast of the program. Thanks Sue! We attended the oral argument today before the Minnesota Supreme Court, sitting in its old ceremonial courtroom at the state capitol due to the election contest ongoing in its usual chambers. Team Franken is asking the Court to require the Secretary of State and the Governor to issue and sign a certificate of election in Al's favor. Team Coleman's response is that such is not allowed by Minnesota law. Any reasonable legal observer would conclude that the Court is unlikely to grant the petition to force the issuance of the certificate. Team Franken was arguing against rather clear statutory language and the claim that somehow Minnesota has "opted out" of the federal system by only having one senator at the present time was unpersuasive at best. Team Coleman did well, both in its briefing and at oral argument. Look for the petition to be denied and the contest to continue unabated and, quite likely, for many weeks. Rod Grams withdrew late this afternoon from the race for the Chair of the Republican Party of Minnesota. What do you think about this development? If you supported Senator Grams previously, who are you leaning toward now and why? Let us know in your comments.